At the start of a each year we tend to look back at the previous years achievements and 2018 was another stand out year. Amongst the highlights were the new nameplates for the locomotive which sponsored by 2 of our members and unveiled at the Societys in March. 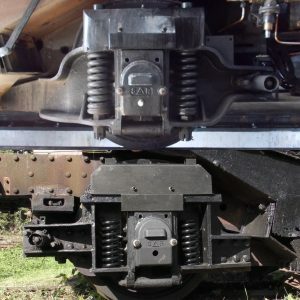 The biggest engineering success was gathering all the major components required to overhaul the trailing truck once the locomotive has been stripped down. Securing all the major parts for the trailing truck saw the project undertake many firsts including the first component made from our own patterns (axle box covers) and the first component made from Society generated CAD (trailing truck spring beams). All this work al lowed us demonstrate the difference between our unique fabricated trailing truck and the far more common cast version. Work was also undertaken at Sellindge in the form of general maintenance and preparing the locomotive for a future move. Thanks to our amazing supporters we also secured many original parts for the locomotive including a whistle valve, lamps and a speedometer. Work is on going with the machining of the Klinger Valves with Ian making steady progress. Inside the valve is what is known as a lantern. Its job is to apply pressure to the packing that seals the valve piston by allows steam to pass through it when the valve is open. It is not been possible to obtain stainless steel castings which meant Ian had to machine them out of a solid billet of stainless steel. The caps of the Klinger valves have been fully machined which was made easier through the use of special trapezoidal taps that sped up the process no end. At our AGM the Society plans to have the completed valves on display test fitted to the manifold. The machining of this particular component is very complex and the Society is extremely grateful to Ian for all his hard work over the past year. T he third annual General Meeting of the Society will held on Saturday 18th May 2019 however the location cannot be revealed at this time. The Society is in the final stages of a agreeing a new base for the locomotive with the contract being discussed at this time. 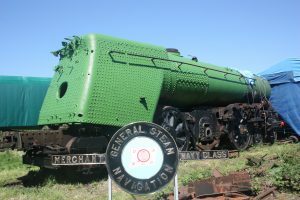 Its planned that the locomotive will be moved to the new site in time for the AGM to allow our members attending to see her and as many of the various parts the Society has gathered attached to her. This has also seen Issue 9 of the Packet being delayed until the contract is signed. The issue is ready to go to the printers so once the deal has been agreed our members will get the news on there doorsteps soon after. 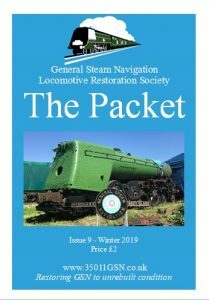 The Packet features some major updates on various fronts including the crank axle, more original components, more parts made from scratch and the galas we are attending in the coming months.